Stanley and Gina Altman have always had an interest in the theatre and, with their 60th wedding anniversary this year, they were keen to celebrate in style. 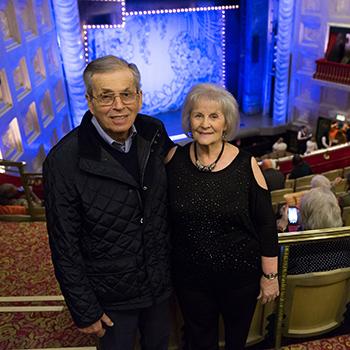 They are celebrating this wonderful occasion and 60 years together by making a dream come true; visiting The Savoy Theatre for a VIP experience at a showing of Funny Girl. The couple met at a wedding and Stanley asked her to dance. Gina thought Stanley was too old for her at the time and so said no, but he kept asking her out on dates. They worked near each other just off Oxford Street, London, and he would wave to her as he passed her shop. It wasn’t until a few years later that Gina finally said yes to a date and they began dating. Dance and music were the cornerstone of their relationship, going to renowned venues like the Empire Rooms on Tottenham Court Road during their courtship. The couple got married 18 months after their first date in London when Gina was 19 and Stanley was 23. The Altmans celebrated their 60th wedding anniversary on February 12th this year. They used to love listening to big band music, now called ‘easy-listening’. Their favourite singers were Ted Heath, Ken Mackintosh. They went to swing nights together and on their dates they’d visit the cinema and the theatre. Gina let Stanley make the decisions on where they’d go and he always aimed to impress. Stanley used to be in a theatre company when he was younger and has always enjoyed acting. He used to star in plays and would spend lots of time at the theatre. Part of an amateur dramatics society, he most memorably performed in Guys and Dolls, with a real passion for the musical side of the show. Gina would have liked to go on-stage but she was too nervous, she would make the tea and coffee for the cast backstage and proudly watch Stanley in the wings. The couple watched the original version of Funny Girl with Barbara Streisand and loved the play, which gave them inspiration for this big milestone in their marriage. The Savoy Theatre is the perfect location for this special occasion for the couple as in love now as they were 60 years ago.